“There are very few plots of land in California that might be worthy of Grand Cru status. 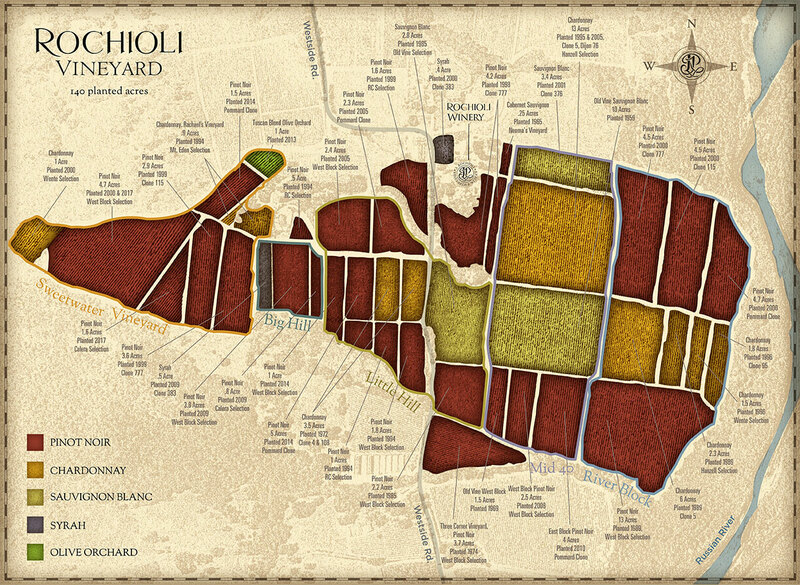 The Rochioli Vineyard is situated in a very diverse part of the Russian River Valley. Joe Jr. and Tom both believe key factors in growing superb grapes come from the diversity in the soil types, the vineyards’ proximity to the ocean, as well as the contours of the valley, allowing for morning fog and cool evening breezes. Today, the vineyard is divided into several unique blocks, each planted with numerous clones. In the 1990s, Rochioli Winery released wines from five blocks, each displaying distinct characteristics. At that point the Rochioli’s established the Russian River Valley as a petite Côte-d'Or with the ability to produce terroir-driven wines. Joe and Tom continue to tend to the vineyards every day, the same way they always have. Armed with an intimate knowledge of the soil, the climate and grapes, they have been successful as growers, and as winemakers of rich and elegant wines. Because of the diverse terroir across their 140 acres in production, Tom ferments each block separately. While this is a common practice in Burgundy, Rochioli was one of the first in the area to introduce a micro-batch process. He believes in being able to taste unique differences between the diverse soil and clonal diversity that typifies the Russian River estate. Tom closely follows a traditional “hands off” approach to winemaking.